Here we are in the middle of August already! My facebook timeline is full of pictures of new shoes and backpacks and shiny-faced 1st day of school pictures. I looked out the window the other day and realized that, all too soon, fall will arrive, the trees will flame in to their fall plumage and then go bare. Then (sigh) it will be winter. But, before I get too far ahead of myself, it’s time to put together the End of Summer Bucket List. These are things that need (neeeeed!) to be done before summer ends so we know we’ve wrung every last bit of life out of the season. Drive with the windows down and sunroof open while listening to some new (aff link) and some old (aff link) tunes. Sit outside on patios and at the corners of open-windowed spots to watch the world go by. Eat. All. Of. The. Tomatoes. Stock up on ice cream for late night snacking. Mix up the last of the summer produce into cocktails or syrups so I can sneak a bit of the summer season into fall. 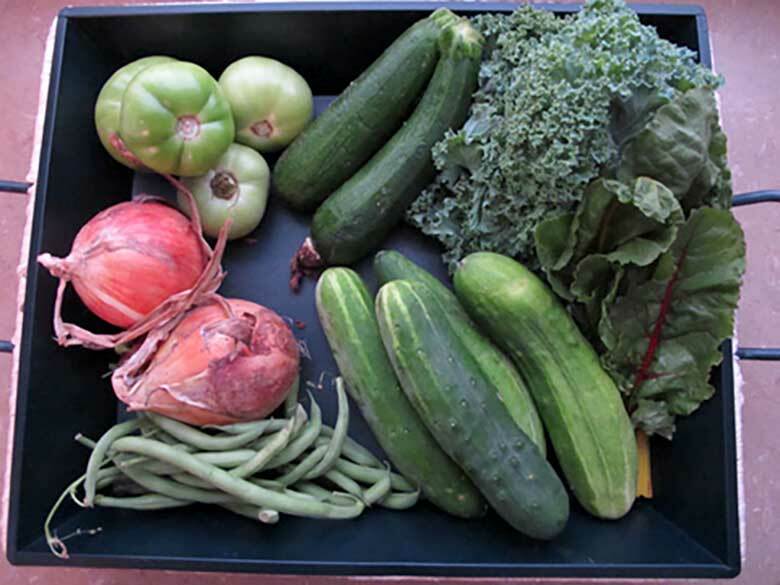 Week Eight’s farmshare bounty. Tomatoes, and beans, and cukes. Oh my! Cantaloupe – Cut up and eaten on its own. Corn – Sautéed with some zucchini and eaten on tostadas. Green Beans – Boiled with potatoes and coated in pesto. Kale – Massaged kale salad. It’s… interesting. Yellow Onions – In my pantry. 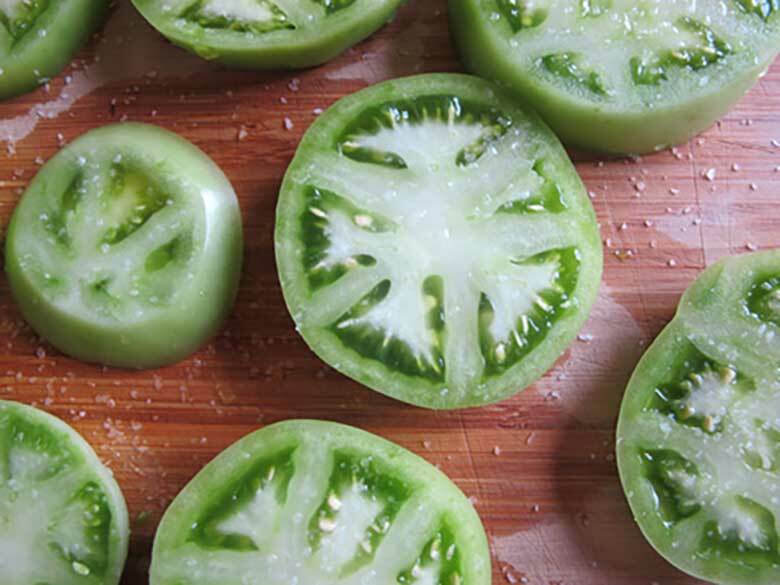 Tomatoes – Made my first ever batch of fried green tomatoes. While I’ve had my share of “standard” BLTs this season, the green tomatoes (with a nudge from our farmer) were begging to be fried and made into a BLT. – Slice the tomatoes and lightly salt them. – Let them sit for a bit. – Coat them in flour. – Dip them in egg. – Dredge them in a mix of cornmeal and flour. – Fry in shallow oil until golden brown. Though not necessarily a convert to always making them myself. 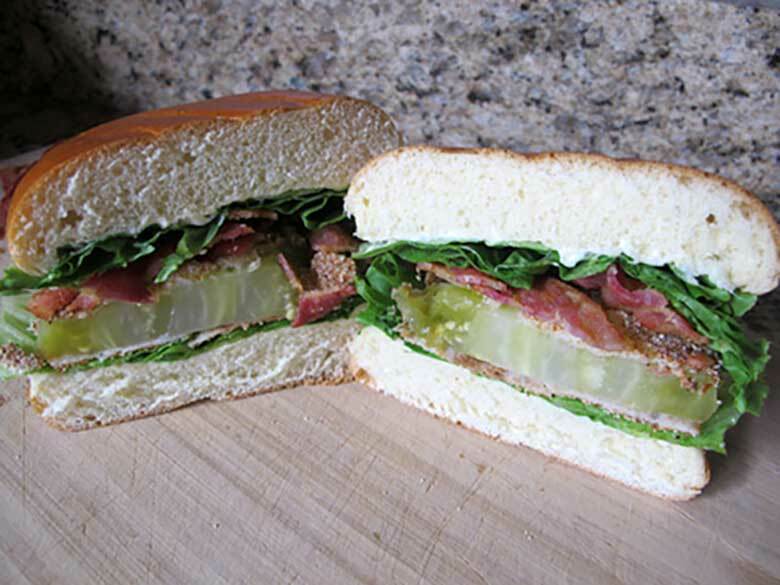 Fried Green Tomato BLT with thick cut bacon, romaine lettuce, a slather of mayo and a brioche bun. So far my compost casualties are still small and I’m a smidgen proud of myself for that. It’s probably a combo of the public-shaming potential of the blog and that I’m trying to be pretty disciplined about using everything while it’s fresh, but I think this has been my best year for limiting the waste. The zucchini that has shown up has been in pretty small quantities (read: not the garden-hogging levels of most home gardeners) so it’s been pretty simple to keep up with, but, after a while, sautéed zucchini gets a little humdrum. This week I busted out the food processor (aff link) and made a batch of Slightly Sweet Zucchini Fridge Pickles from Marisa McClellan’s blog, Food in Jars. Besides her blog, Marisa has written two outstanding cookbooks (aff links) that focus on canning and pickles of all sorts. The remaining two small zucchini were baked up in to a crispy snack/side of Oven-Roasted Zucchini wedges. 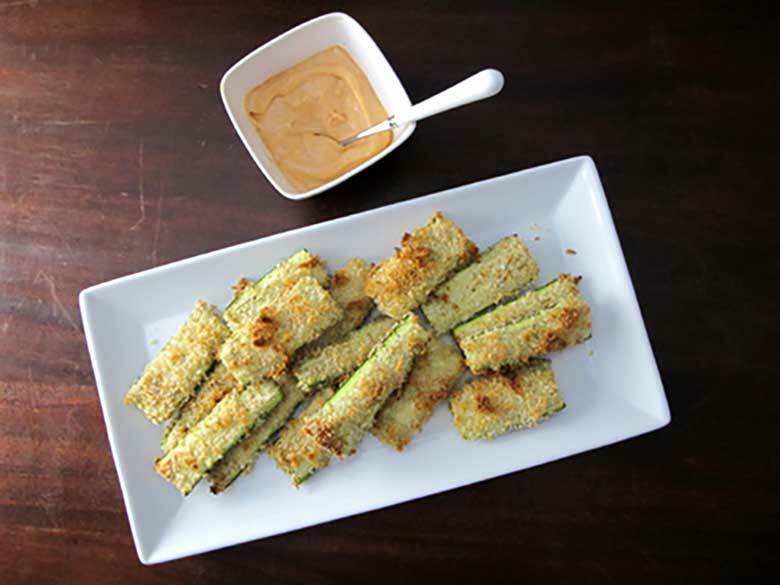 You can find a lot of variations of baked zucchini wedges on the inter webs, but I tried to keep these as simple as possible. Trim and quarter the zucchini. Cut each quarter in half to end up with eight pieces. Place on a parchment or foil lined baking sheet. Baked at 450 for 25 minutes until they were golden brown. These are best the day of, but reheat well in a toaster oven. You can also mix in some parmesan cheese or minced fresh herbs to the panko to “up” the flavor, but sometimes simple just works.